Begin by unrolling crescent roll dough and separating the dough into triangles and preheating an oven to 350 F.
Spray a large baking sheet with cooking spray or cover the sheet with parchment paper. Position the triangles next to each other with the points toward the center, overlapping the long sides by about 1/4 inch. You will be forming a large circle with all of the triangles. Continue laying all the triangles to make a circle. As you arrange the triangles, leave the edges of the seams unsealed so you can adjust them and move them around to get them in a relatively even circle. Use your fingers to press the center of the triangle edges together—just in the center where the filling is going to go. Leave the rest of the edges unsealed so you can fold both the outer and inner edges up and over the filling. Spread the filling evenly in a ring in the center of the dough as pictured. Some people may skip this step, but it's not a king cake without a token! You can use a dried red bean, a whole almond, or a small ceramic baby (representing the Christ child). Here, a fun little ceramic pig is used. When the cake is cut and shared, the finder of the hidden treasure is said to enjoy good luck for the coming year. The lucky recipient may also be expected to bake the King Cake or throw the Mardi Gras party for the following year. Place your token somewhere in the filling before enclosing the filling. Fold the outer edge of each triangle toward the center just to the edge of the filling to cover. Continue in the circle until the filling is enclosed. Lift the pointed ends of the triangles up and over the cake toward the outer rim of the pan to fully enclose the filling, tucking under the points if they're long. Lightly press the seams. Brush the cake with the egg wash.
You can bake the cake now if you'd rather proceed with a traditional version that will be colored with icing at the end. 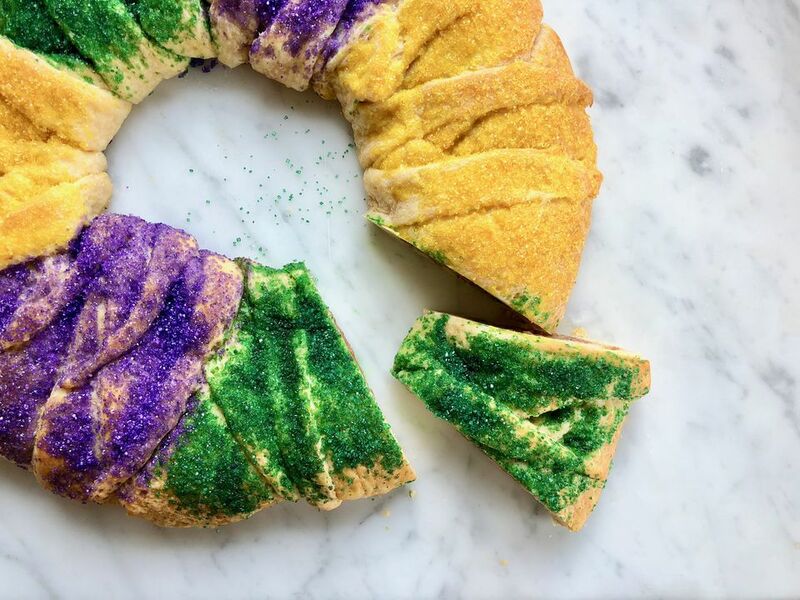 For the easiest king cake ever, though, you're going to add the color before baking, by creating wide stripes of color with the sanding sugar as shown here. Whether sugared or not, bake at 350 F until golden brown and cooked through, 30 to 35 minutes. Let cool to room temperature. 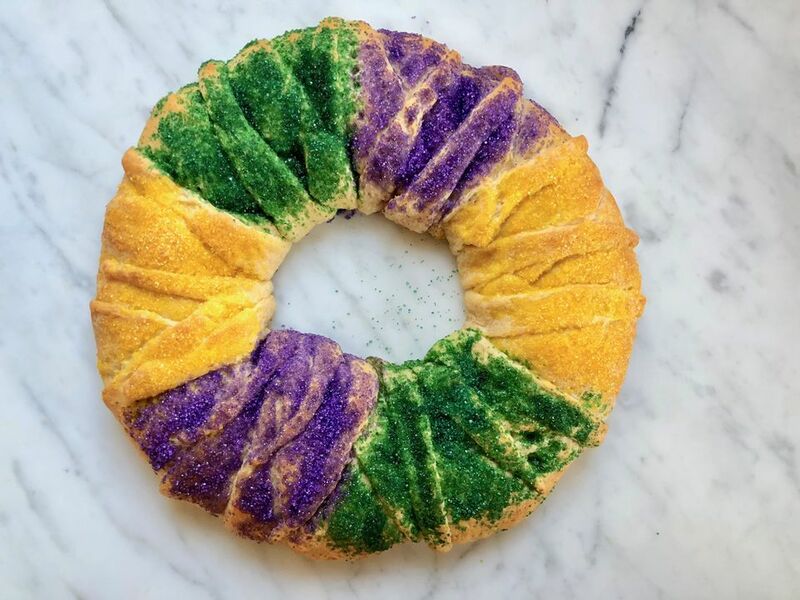 Your king cake is ready to serve. Like most baked goods, it is best the day it is made. If you like easy, but you also like icing, feel free to drizzle on white royal icing—it looks pretty with the colored sugar. For a more traditional iced king cake, divide the icing evenly between 3 bowls. Add 2 drops purple or 2 drops each of red and blue to the first bowl to make purple. Use 2 drops yellow in the second bowl and 2 drops green in the third bowl. Mix the icing in each bowl so the dye is completely incorporated for an evenly colored icing. Use a spoon or spatula to paint wide striped of each color on the cake. For better control, scrape each individual bowl into its own sealable plastic bag, squeeze out all the air, seal the bag, snip off one corner of the bag, and use as a pastry bag to pipe wide stripes of icing on the King Cake. The icing should firm up and the cake ready to serve in about an hour.